Learn how to create surreal character designs with the latest issue of ImagineFX magazine, which goes on sale in the UK today. In the pages of issue 171, you'll discover how to paint character concepts with bright hues and expressive lines that are sure to get noticed. 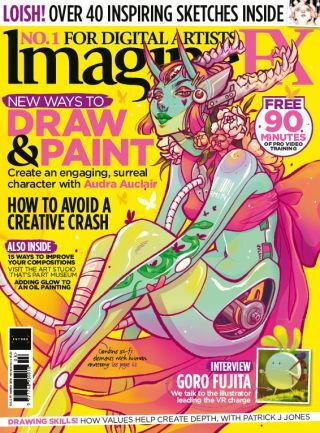 So if your character designs have been feeling a little flat recently, or you just want to try some new creative techniques, this issue is perfect for you! Elsewhere in issue 171, Patrick J Jones continues his figure drawing masterclass series to teach you how to create depth by using values. With the help of his techniques, you'll be able to create the illusion of the third dimension and really make you art stand out. On top of that, Eeva Nikunen is on hand to show you how to paint a fantasy portrait with oils, and Gina Nelson shares how to work with ink and gold. There's also all the latest news, reviews and reader art that you've come to know and love from ImagineFX. Don't miss out, grab yours today! From over-working to not looking after yourself properly, there are plenty of ways artists can find themselves heading towards a creative crash. To protect yourself from burnout, and to hear how to bounce back from it, we spoke to several industry-leading artists who have dealt with a creative crash in various ways. Despite being repeatedly touted as the future of digital art, the potential of VR is still questioned by some creatives. Not Goro Fujita though. We caught up with the Japanese artist to discuss his career so far and hear why he has been fascinated by the unique creative opportunities that VR offers. Digital art superstar Lois Van Baarle has opened up her sketchbooks for you to flip through this issue. Here you'll find a variety of sketches that show off her range of artistic talents, as well as notes from the artist herself about how they came to be and how they informed her style. Chances are you'll have heard of the Golden Ratio, the pleasing proportion of details that can harmonise a piece of art. There are plenty of other ways to create a powerful composition with a sense of direction, as comic artist Steve Ellis reveals with these striking suggestions that will draw your viewer's eye. VR tools such as Quill can radically speed up the creative process for digital artists. Here, freelance illustrator Martin Nebelong walks us through how he managed to quickly mock up a base for a book cover illustration with virtual reality, before finishing up in Photoshop.